Deutsche Bank current and former employees can sue the company as a class for allegedly filling their 401(k) plan with expensive funds that earned fees for Deutsche Bank ( Moreno v. Deutsche Bank Americas Holding Corp. , 2017 BL 311666, S.D.N.Y., No. 1:15-cv-09936, 9/5/17 ). A class of 22,000 to 32,000 participants and former participants in the banking giant’s 401(k) plan was certifed by a federal judge Sept. 5. The company argued that class treatment was inappropriate because about 12,000 plan participants never invested 401(k) dollars in a single in-house fund. The judge disagreed, saying that class certification doesn’t require that “all issues must be identical” for each class member. 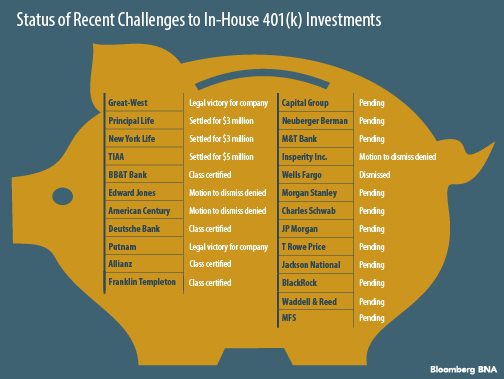 More than two dozen financial companies—including JPMorgan Chase Bank, Charles Schwab Corp., and Morgan Stanley—in the past three years have been targeted by proposed class actions challenging the in-house investment products in their workers’ 401(k) plans. Many judges have ruled against the financial companies, refusing to dismiss cases against American Century, Insperity, and Edward Jones. Cases against BB&T, Allianz, and Franklin Templeton have been certified as class actions, although the judge hearing the Franklin Templeton case recently signaled a willingness to rethink whether class certification was appropriate. A similar case against Putnam Investments was certified as a class action before the judge ruled for the company on all claims after a seven-day bench trial. In general, these lawsuits argue that financial companies violate their fiduciary duties under the Employee Retirement Income Security Act when they fill their employees’ 401(k) plans with funds that earn fees for the companies, instead of less expensive options available from competitors. Deutsche Bank’s argument about the variation in participants’ investments and returns defeating class certification has been “repeatedly rejected” in the ERISA context, the judge said. The judge was similarly unpersuaded by Deutsche Bank’s argument that some plan participants’ claims may be barred by release agreements or statutes of limitations. The important thing was that the participants all challenged the same alleged misconduct on the part of the company, the judge said. Finally, the judge said the proposed class met the certification requirements of Federal Rule of Civil Procedure 23(b)(1)(B), which authorizes class actions when the prosecution of separate actions would lead to rulings that could substantially impair the ability of non-parties to protect their rights. Deutsche Bank is one of the top financial groups in the world and the largest bank in Germany, with nearly 2,815 branch locations worldwide. Through its subsidiaries, Deutsche Bank has more than $800 billion in assets under management, according to data on the Bloomberg Terminal. Judge Lorna G. Schofield of the U.S. District Court for the Southern District of New York wrote the decision. In an earlier order, Schofield largely denied Deutsche Bank’s motion to dismiss. Nichols Kaster PLLP represents the plan participants. Goodwin Procter LLP and Holland & Knight LLP represent Deutsche Bank. Text of the decision is at http://bloomberglaw.com/public/document/Moreno_v_Deutsche_Bank_Ams_Holding_Corp_No_15_Civ_9936_LGS_2017_B?doc_id=X1L32QLDG000N.